Ashlee Michalski, 27, had her first open heart surgery shortly after birth in Syracuse, New York. In the same hospital, Janusz Burzynski, MD, was completing his pediatric cardiology fellowship training. 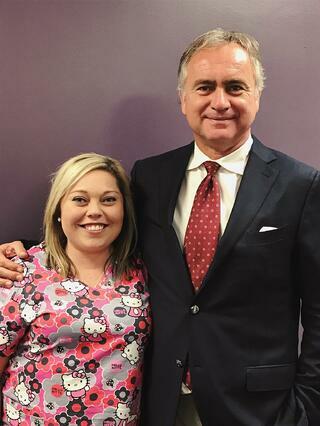 Although Michalski and Burzynski parted ways during her early life, the two reconnected as patient and physician in Florida when Ashlee was 5 years old. Now two decades later, Michalski works for and is treated by Burzynski in the Pediatrix Cardiology of Orlando practice. Michalski was born with single ventricle hypoplastic left heart syndrome, a congenital condition where one chamber of the heart fails to develop. “I was born with three chambers, but really only two are working for four,” said Michalski. Burzynski was a member of the team of physicians who saved Michalski's life as a newborn, and performed the life-saving procedure to open the connection between the two aria (upper chambers) of her heart. “It was a rare and fatal illness at the time,” said Burzynski. “She could survive in utero, but when she was born she quickly became very sick.” For Michalski, the additional complication was that two atriums of her heart were unable to communicate. Until recent years, this type of congenital heart disease often ended in early death. As she grew, Michalski had certain restrictions, such as no caffeine, “which meant no chocolate,” she said. She was also on a low sodium diet and medications. By age 5, Michalski and her mother had relocated to Florida, and her mother had one specific concern: Ashlee needed a pediatric cardiologist. “My mother looked in the yellow pages and found a ‘Dr. Burzynski’,” said Michalski. “[My mother] couldn’t believe it, and when she called the office, she asked if he was the same one who had been a fellow in Syracuse.” It was indeed, and he became Michalski’s doctor once more. By 9 years old, Michalski was experiencing reoccurring episodes of tachycardia, where her heart would race even at rest, she said. Her mother took her to Boston Children’s Hospital to be evaluated. Michalski ultimately received a pacemaker, which was her fifth open heart surgery. “Physicians don’t take pacemakers lightly at that age,” said Burzynski, but the device allowed Michalski’s heart to regain a normal pace and lessened her dependence on medications. It also let Michalski engage in physical activities, which had been limited in her early years. For 13 years, Michalski participated in competitive cheerleading and served as team captain for two years. “It’s exciting for any physician to see how their patients grow,” said Burzynski. “It is tremendously satisfying to be part of the team who saves a newborn, and now to see who she is as a young woman.” The success of Michalski’s care is a vast improvement from when Burzynski entered the field of medicine. Burzynski was born, raised and educated in Poland. Before immigrating to America in the 1980s, “I spent time in clinics and saw people with congenital heart disease. It was a new field then, and not a lot of patients were doing well. There were no standards and many hospitals were trying different things. We learned as we went,” he said. Learn more about , an affiliate of MEDNAX. Pediatrix Cardiology is a national provider of outpatient and inpatient cardiology care of the fetus, infant, child and adolescent, as well as adults with congenital heart disease. Our affiliated cardiologists provide care to patients through 21 practices.